Often in our shootouts, we try to keep the list of tools reasonable. With so many features to consider and tons of wood to cut, it doesn’t typically make sense to invite everyone to the party. Sometimes it’s a price point, battery voltage, or top-rated tools that make the cut. But this time, we invited everyone with the best cordless circular saw they have across multiple classes. However, we did leave the 12-volt class out. We wanted to run the best cordless circular saw shootout to determine models that would make for a primary tool on jobsites. That said, a few brands declined to participate with certain models or altogether. Even with this comprehensive of a shootout, new models are currently under development. The good news is that we were able to get two of the newest models in: the Makita 18V X2 LXT Rear-Handle Circular Saw and the DeWalt DCS570 20V Max 7-1/4-inch Circular Saw. Editor’s Note: This article was republished as part of Pro Tool Review’s Best of 2017 week. It originally published earlier in 2017. PTR tested every cordless circular saw 18 volts and up that we could get our hands on. 6-1/2-inch blade or 7-1/4, left blade or right, sidewinder or inline, even a unique Euro-saw—they’re all here. And since this unlimited class test included different voltages and saw sizes, we tested each saw with the largest battery available from the manufacturer to see the maximum capabilities of each saw. Like many contemporary battery-powered tools, circular saws chase the goal of the cordless jobsite. They’re not all there yet, but I can say that for most of these tools, you’ll never miss your corded saw as far as convenience is concerned. With the strongest and mightiest of the group, you’ll never miss it for its power either. When I first tested the full category of cordless circ saws a decade ago, 18-volt saws didn’t match up to the task of general construction site cutting. A decent trim saw or two revealed themselves in that voltage, but it took 28- or 36-volt saws to handle framing materials. This made up only a few of the available tools in total. Jumping ahead five years to my next category saw test, I found a rapidly evolving product selection in the 18-volt class and found some 18-volt tools that could outperform the previous 36-volt winners by a fair margin. The best of the bunch could even compete respectably close to the speed of cutting with a premium corded saw in various materials. Now another five years have passed, and the progress of cordless saws is leaping way ahead. Some brands have even adopted computer chip-controlled brushless motors and the latest in high-density lithium-ion battery cells with ever increasing amp hour ratings. This exciting shootout marked the first time a few standout cordless saws have equaled or even eclipsed the capabilities of many 15-amp corded circ saws! Mindful of the latest developments in new cordless tool voltages and growing battery packs, it didn’t make sense to limit this test just to the 18-volt class of saws and the commodity battery packs they are typically kitted with. As it turns out, we would’ve missed out on some of the newest and best saws if we had. In the spirit of holding an unlimited-class shootout, we went big. We got just about every saw 18 volts and higher on the market. There are a few omissions from a major brand or two, but those saws are currently being retooled or discontinued. To make order of the mixed bag of circular saws tested, they can most easily be categorized as either 6 1/2- or 7 1/4-inch blade models. Divisions within the best circular saw shootout category include blade-left or blade-right saws, with voltages listed in increasing order. Though it has a proprietary metric size blade slightly smaller than 6-1/2 inches—among many other unique features—the right blade Festool HKC 55 EB best fits in this category for the sake of bookkeeping. Several 18V class saws share the blade-left design common with 6-1/2-inch blade models including the Bosch CCS180, Makita XSH03, Metabo KSA 18 LTX, Milwaukee 2730-20, Porter-Cable PCC660, and Ryobi P507. The 21.6 voltage has two players – the blade-left Hilti SCW 22-A, and the less conventional right-bladed Kobalt KCS 6524B-03 (technically listed as 24-volt Max). The 36-volt blade-left Bosch 1671 rounds out the 6-1/2-inch saws. Like the corded circular saws they share a design with, most 7-1/4-inch cordless saws have blades to the right side like the 18-volt class DeWalt DCS570, Milwaukee 2731-20, and Ridgid R8653 models. Makita’s 36-volt saws are powered by two 18-volt battery packs and come in both the XSH01 blade-right model and as the only rear-handle, inline cordless saw available, the XSR01 (with its blade on the left). The DeWalt FlexVolt DCS575 circular saw tops the voltage list at 60V Max with its blade-right saw that is nearly identical in design to the new 20-volt Max saw also in this list. We invited each brand to send their preferred battery to power each saw during the testing so we ended up with some battery packs as high as 9.0 amp-hours that are typically sold as optional accessories. Not all brands offer such a wide range of battery options and some tools already came kitted with the optimum battery, so we tested with a diverse range of battery packs. A DeWalt FlexVolt battery running a 60V Max tool is rated at 3.0 Ah so that’s what DeWalt’s higher voltage saw used. The 18V Makita, Porter-Cable, and Ryobi saws along with the 36V Bosch saw all had 4.0 Ah packs. The Kobalt and both 36V Makita saws used 5.0 Ah packs, both Festool and Hilti 5.2 Ah, the Bosch 18V 6.0 Ah, and the Metabo used a 6.2 Ah pack. The remaining DeWalt, both Milwaukee saws, and the Ridgid all had 9.0 Ah packs. The 20V Max DeWalt also used a FlexVolt battery which is rated at 9.0 Ah at that voltage. The basic formula for watt-hours is simply the voltage times the amp-hours. Watt-hour ratings are supposed to be accurate for the purpose of lithium-ion shipping regulations but some of the battery pack’s amp-hour to watt-hour calculations do not compute. Those affected by mystery math are noted as “claimed Wh” in the individual tool profiles. Do you know what features to look for on a circular saw? To evaluate the performance of the saws, I first fitted them all with identical 24-tooth Irwin Marathon WeldTec blades to make sure I was testing the saws without any influence of the stock blades. The Festool takes special blades, so I used it with their own 18-tooth blades throughout the testing. Special thanks goes out to The Home Depot for supplying the materials for this shootout. Pros know that materials drive up the cost of any project and it was no small amount of wood that we cut up getting these results for you. So if our testing helps you decide which of these if the best cordless circular saw for you, remember that The Home Depot made it happen, and visit your local store for purchase. I started out in easy-to-cut 2×12 lumber checking the ergonomics and basic feel of the saws in use. Then I moved on to critical operational features such as the accuracy of cutline markers, blade visibility, guard operation, and the ability of the saws to track straight against a rafter square and straightedge. 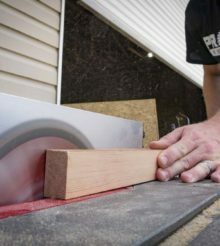 Any saw can cut straight through the middle of a board, but it’s important to be able to make accurate shave cuts to sneak up to a tight fit. I tested the saws’ abilities to make thin shave cuts of different widths without their lower guards hanging up. And I checked out cutting with each saw from the left side and right side of materials to see if there were any problems for lefties. After all the qualifying laps were done, it was time to take these saws to the races. Performance testing to determine the power of power tools to boils down to racing them against each other in identical tasks in speed-of-application trials. Simply put, the circular saw that gets the job done fastest has the most available power to apply to the work. For this best circular saw shootout, I laid in a supply of sheets of 3/4-inch subfloor to challenge the saws. OSB was chosen for its density and uniformity. After repeated trials through one layer of the material, it was obvious that the saws needed a tougher task. Cutting times for a four-foot crosscut were down in the three to four-second range for many of the tools. Cutting three sheets at a time provided the best challenge to differentiate the saws with the power to do it all on the job versus milder-mannered models. Since not all of the saws have the cut depth to make it through all three sheets, I set each saw for a two-inch cut. Usually, I time circular saw trials with my homemade timing rig made of a straightedge with start and stop microswitches embedded along one side and wired to a hacked stopwatch. Unfortunately, in this test, I had enough saws that would not guide true against a straightedge so the rig couldn’t be utilized. A few saws pulled away from the guide and missed the second switch. Others ran in toward the guide and ground to a halt. I ended up following drawn lines freehand, so I could push as hard and as fast as the saws would go while a helper recorded the times. I pushed the saws as hard as they could keep up with without excessive straining, and most saws settled into pretty consistent times. For saws that stalled a few times during the first trials, I tried again pushing more gently but none of the speeds were improved. For saws that didn’t stall, I added more force and recorded more times. For most saws, I eventually found the stall out pressure to stay below, but a few never stalled and just refused to move any faster despite my feed pressure. Some motors go from full RPM to a sudden stall while others slowed and gave me good feedback of how hard to push. In general use, a saw with clear feedback is my preference. The mightiest saws never stalled during the trials that found the limits of the rest so I went another round with them, ramping up the pressure and breaking previous speed records. At the end, I was left with two super-powered saws that went as fast as I could. I attempted a few tie-breaking runs, but I couldn’t realistically and safely test them any faster. The point was proven anyway. The highest power cordless saws available show no speed or power compromises when cutting tough materials and have earned their place on the construction jobsite. Because of the great diversity in tool voltages and battery amp-hour ratings, we declined to perform runtime testing for these saws. A lot of runtime is based on watt-hours of the batteries, so all things wouldn’t be able to be considered equal with the testing. With batteries ranging from 72 to 180 watt-hours, some have a lot more fuel in the tank than others. Add to that the fact that mere 3.0 Ah battery packs running older technology saws made it through hundreds of feet of OSB in my saw test several years ago. So with 16 saws in our shootout today, I’d be worn out long before the latest mega-packs would be. Pros and DIYers alike appreciate tools with the best performance, but we know that everyone reading this shootout won’t automatically run out and buy the top-rated tool. There are different varieties of “winners” once certain realities are factored in. Price is one factor. It might be hard to justify the considerable expense for a seldom-used tool. But if you’re already invested in a cordless tool platform, system compatibility is likely of more concern. The reader who has already invested in a ton of tools, batteries, and chargers from XYZ brand is probably reading with keen interest in how the XYZ saw performed. If it is good enough, that’s probably going to be the one he buys, regardless of its exact placement in the ratings. This is one reason we comprehensively test and evaluate all of the models in the shootout. We don’t do eliminations which focus the most attention solely on the highest performing tools, which are oftentimes the highest priced, too. Reflecting the fact that most cordless tools are sold a la carte these days, (referred to as bare tool, or tool only), most of the tools, batteries, and chargers came to us as separate components. Of course, many of the tools are available in a kit form too, complete with battery pack(s), charger, and sometimes a case or bag. A kit typically represents a better value over a la carte prices for those just buying into a specific system or for existing users who need more chargers and batteries, but kits probably won’t come with the highest amp-hour battery packs available. Additional Notes: This saw struggled through much of the test cutting and would stall out frequently as its blade would dive at an angle away from the cutline. I believe a fatal design flaw is to blame. The saw’s shoe and body are structurally connected at the end of the plastic upper guard assembly. The black plastic is very flexible even at room temperature, and it follows that out in the sun it becomes even looser. With nothing substantial holding the blade straight, pushing down on the saw causes the body to twist which angles the blade into the cut. To make this saw perform, it takes a steady hand to stabilize the body, and setting the depth of cut as shallow as possible can help. Of course, this is all too much trouble. Porter-Cable’s light duty saw generally cut the slowest, due in part to a flawed, overly flexible design. Additional Notes: This light-duty saw was outclassed by most of the tools in the test, but it’s not flawed. It could be a valid saw for occasional and/or lighter work. Ryobi’s super-lightweight saw matches with lightweight performance and capabilities. Additional Notes: Though very solid in build quality, this saw needs to be updated to keep up with the competition. It runs at only half the RPMs of some of the other saws, which provides a lot of torque, but forces you to feed the cut very slowly to avoid a ragged edge. A heavy saw from Metabo with some clunky features and slow cutting speed holding it back. Additional Notes: Enough gusto for a trim saw, but doesn’t have what it takes to be a full-on framing saw. Timid performance and some inaccurate features hold this saw back to the lower end. The brand new 6.3 Ah Bosch Core18V battery is too big to fit in the saw, but a modified version of the saw housing is being produced going forward. To promote full battery pack compatibility among their 18V line, Bosch will replace the housing for existing saw owners free of charge. Or you could save the hassle and shave the plastic ridge off the back of the saw with a utility knife like I did. The larger battery robs a bit of the already low blade depth though, even in the redesigned housing. This Bosch saw is one of the oldest models in the test, and it lacks the power and depth-of-cut improvements of most newer models. Other Features: Plunge-cutting, fits Festool tracks and special miter guide rail (FSK 420) that sets for precision crosscuts or miter cuts up to a 60° angle to the left or right, vac dust port, battery gauge on tool. Additional Notes: Built and priced much more like a plunge-cutting track saw built for accuracy than a general construction or framing saw. Intended to do the work of a circ saw, miter saw, and table saw for carpentry and basic trim work. Made in Germany–the only saw in the test not made in China. The Festool is really in a class by itself as a combination track saw/freehand circular saw with finesse features not found in the other construction-oriented saws in the test. The point totals for tested categories fail to show how versatile and useful this saw really is. Editor’s Note: After concerns were raised about the saw’s tracking performance, we retested a second sample and did not find the same issue. The tracking of the original test saw potentially affected the cut quality and speed of the saw, so the ratings and rankings may not be representative of how you should expect this saw to perform. Please check out the standalone review for a better idea of what the saw is capable of. Additional Notes: This heavy saw lagged behind the rest of the full-size saw category as well as several of the more compact models in the test in both general performance and cutting power. The extra height of the 9.0 Ah battery pack keeps the saw from cutting at full depth, limiting cuts to about 2 1/4 inches (–1/8”). Ridgid’s sleek saw underperformed the rest of the full-size models. Additional Notes: Though now called 22V, this is the same saw that used to be labeled 18V in the U.S. market. The battery pack has an extra cell in each series set, so it’s actually 21.6V. Hilti makes a solid, well-designed saw with high marks across the board in general performance ratings, but it’s a bit lackluster in the power department. Cutline Marker Accuracy: On at 90°. On at 45°. Additional Notes: This tool topped all of the early cordless circular saw tests and became the one to beat. And by now, many saws have done that. It’s still capable of respectable performance, but it’s obvious that it no longer requires a 36V battery to do what it does. And every other saw of its voltage class powers a full-size 7-1/4” blade by now. As a result, it’s the bulkiest and heaviest 6-1/2” saw going. An oldie but goodie—but past its prime. This model from Bosch has been around long enough to have participated in all my cordless circ saw tests during the past decade. Additional Notes: Unlike other 6-1/2” saws, this one has the blade on the right side. And its skinny, tuna-can shaped motor is positioned down into the saw’s shoe to gain every bit of cutting depth possible. Though called 24 volts max, the actual voltage is 21.6 volts. The second fastest cutting and deepest cutting 6-1/2-inch saw – this unusually-formatted saw from Kobalt does a lot with its shallow outer-rotor motor. Additional Notes: Not the fastest cutting 6-1/2-inch saw in the test, but undoubtedly the strongest – I never got this saw to stall during all the challenges it faced during testing. This Makita is the all-around standout among 6 1/2-inch compact saws in the shootout with high power, very good performance ratings, and a full feature set. Additional Notes: A Very Good rated full-size workhorse saw that does everything well, and one of only two 18-volt class saws that can really get the job done with a 7-1/4″ blade. Not quite as fast as the 6-1/2” Milwaukee under load, but the larger blade takes more effort to crank through the wood. Milwaukee is the only brand to offer blade-right or blade-left sidewinder saws in the same voltage platform. Milwaukee’s fast–cutting 18-volt saw is full size with a 7-1/4-inch blade and top notch pro features. Additional Notes: A strong and fast saw – would’ve been the 6-1/2-inch blade standout if the guard didn’t hang up in common shave cuts (with the cutoff scrap to the right side). This can be worked around by setting blade depth shallower but it’s an extra step. Milwaukee is the only brand to offer blade-right or blade-left sidewinder saws in the same voltage platform. Milwaukee has the fastest cutting saw with a 6-1/2-inch blade which ranked in the top five overall with its 18V motor stacking up favorably against some higher voltage saws. Additional Notes: One of the newest saws in the test and real standout for the standard voltage class. Though it looks nearly identical to DeWalt’s Flexvolt saw in form and features, different internals in this saw provide less power under heavy loads. This brand new 20V max model from DeWalt is the fastest cutting saw in the 18-volt class and it does so with the benefit of a full size 7 1/4” blade. Additional Notes: This sidewinder saw is part of Makita’s X2 system that derives 36V power from two 18V battery packs. Makita is the only brand to offer super-powered 36V sidewinder and inline saws—both full-size 7-1/4” blade models. Just bumped from being Makita’s strongest cordless saw by the new rear handle saw, this older model is a bit overshadowed as the weaker of the two and shows a few rough edges in the form of lower general performance ratings. The high-performance Makita X2 sidewinder is right behind the power leaders with the second fastest cutting speed and the greatest cut depths. Additional Notes: Though it looks nearly identical to DeWalt’s new 20V max model in form and features, different internals in this saw provide much greater power under load. This makes it the strongest cordless sidewinder available and certainly the top-ranked one represented in our Best Cordless Circular Saw shootout. The DeWalt Flexvolt saw is one of two standout heavyweights that are essentially unstoppable—a true replacement for a corded sidewinder circ saw. Additional Notes: This rear-handle saw is part of Makita’s X2 system that derives 36V power from two 18V battery packs. Makita is the only brand to offer super-powered 36V sidewinder and inline saws – both full size 7-1/4” blade models. This saw features a “hectile” drive similar to the hypoid gearing of the brand’s corded inline saw. The Makita rear handle saw is one of two standout heavyweights that are essentially unstoppable – a true replacement for a corded inline circ saw. Why did you never review the newer Metabo circular saw? ..which had already released by the time of this review, no less! Seems a little wonky to me 🧐 I’m sure it would’ve preformed much better than the 2011 saw tested. It seems like the Bosch offering is almost old enough to collect social security, so I believe it would pay for itself in very little time. I wanted to see DCS577X1 Flexvolt 60V Max 7-1/4” Framing Saw, 9.0Ah Battery! Yes. I am big Dewalt fan!